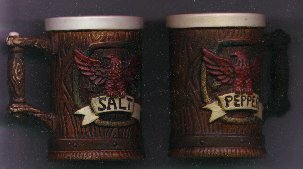 "Unigue Handpainted Salt and Pepper with Eagle." (478) Eagle and Brown Salt and Pepper Shakers.- Condition: Very Good These Salt and Pepper Shakers measure 2 1/2" by 3 1/4". Both shakers are done in Dark Brown, and formed to look like they were carved from wood. The material is a dull almost bisque like finish. There is an Eagle on the front of each one done in a deep wine color. They are labeled Salt and Pepper. The top of the Salt Handle has a white dot, and the Pepper has a Brown dot. They were handpainted and made in Japan. Price: $6.00 + shipping.